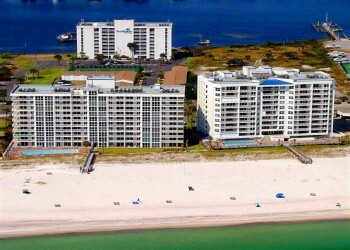 Located directly on the sugar-white sands and emerald waters of the Gulf of Mexico. This fifth floor corner unit has outstanding views through its gulf-front Master bedroom with king-size bed and private bath, 2nd bedroom queen-size bed with insuite bathroom, 3rd bedroom has twin beds with jack-n-jill bathroom access. Full kitchen, with granite coutertop, stainless steel appliances. Roomy living room with queen-size sleeper sofa, wall mount 42" flat screen tv with dining area, entry onto the private balcony from master bedroom and livingroom. High-speed internet. Beach service available for a fee on the beach, large outdoor pool, hot tub. Just across the street to riverside of this property tennis court and boat dock access. Paradise awaits you. Call or email for rates and availability. Investors/Owners . . . Tourist/Visitors . . . Realtors/Agents . . . Listing Courtesy of the USA Beach .Network : List Your Beach Property FREE!